James spotted this wonderful ceramic Bad Taste Bear on ebay a while back and brought our attention to it via a thread on our forums. Having seen the small pictures on ebay I decided to buy one myself, but the images really didn't do this justice! The attention to detail is superb. From the make-up, through the detailing on the shoes through to the sparkle on the gloves, this is one of the best ceramic The Rocky Horror Picture Show inspired items I have seen for a long time. The expression they have managed to get on the bear is quite "Tim" - a certain look of confidence and animal passion (well it is a bear after all) goes a long way to making this a stand-out product. 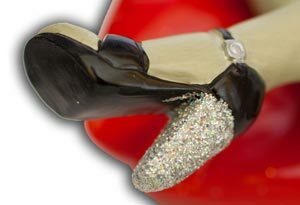 As I said the detailing is fantastic, have a look at this shot of the shoe detail with the sparkling heels and clasp painted to perfection. Check out the Bad Taste Bears online and you find a huge range of movie inspired bears doing things they shouldn't. I love the whole concept, maybe it appeals to the part of me that is just that little rebellious? Either way, their Rocky Horror Picture Show bear has found a home on display in my house. I just won't let him light the cigarette! 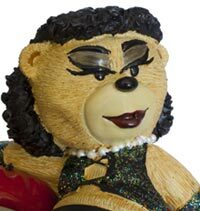 The bear sits on a pair of luscious lips and the whole item measures about 13cm long by 8cm wide by 7 cm high. A real Rocky fan's collectors item if ever I saw one. We bought our one on ebay from Cosmic Gifts for £17.99 including delivery on Thursday, April 8th, 2010. You can also buy them from other online retailers.